FLY FISHING INSTRUCTOR, GUIDE AND AUTHOR. Hi, I'm James Waltham. 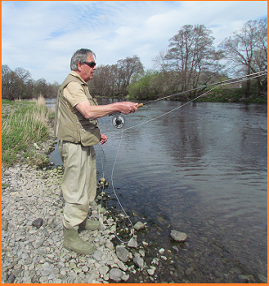 I am a qualified fly fishing instructor and I have been teaching for over 40 years. I have written a number of books on the subject which include 'Sea Trout Flies', regarded as an angling classic, and 'The Sea Trout and the Fly'. (see me on Google) I have also written for many leading game fishing publications and until recently was the angling correspondant for NorthWales Newspapers. I have invented many flies including the well known Snake Fly which is famous the world over. I also lecture on game fishing topics and give fly-tying demonstrations. Needless to say, I am fanatical about fly fishing and enjoy nothing more than passing on my skills and experience to others. I believe that learning to fly fish should be an enjoyable experience and I am dedicated to teaching you in a friendly, informative and relaxed atmosphere while helping you to take your fly fishing to another level. If you wish to start fly fishing or would like to improve on your existing skills I am here to help you. I am based in North Wales in the beautiful Vale of Clwyd within reach of North West England, the Midlands and the whole of North Wales. I am able to offer you lessons on a beautiful and secluded lake with has easy access and good parking facilities, or at two alternative lakes. I hold a Child Protection, a Level 2 POVA (protection of vulnerable adults) certificate and a CRB certificate. Lessons are available all year round.